David de Young founded HowWasTheShow in 2002. In 2010, he handed over the reins and moved to Finland. 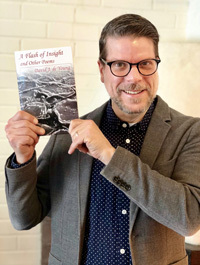 This month he’s returning to Minnesota for the first time in 5 years to celebrate the release of his first collection of poetry, A Flash of Insight and Other Poems Tuesday, April 24th at the Bryant Lake Bowl in Minneapolis. Showtime 7 pm. Tickets $6 (which can be applied as credit towards the purchase of the book at the event.) More info on the BLB site here. When did you first get the idea to put this book together? You know, I hadn’t really thought about publishing a book until very recently, like in the past 2-3 years. I had a long dry spell (more than 25 years!) when I did not submit any poetry for publication at all. After a couple of submissions were rejected in 1984 and a handful more in 1989 I stopped submitting. The reason those poems were rejected was likely that they weren’t good enough for the periodicals I was submitting to. I’ve now rejected the same poems myself as I don’t think any of them are included in this book. Back in the ‘80s when I thought about publication, I was thinking only about literary magazines and publishing a full-length book was beyond my comprehension. Nowadays, self-publishing of chapbooks and collections is a more viable route for poets than it used to be, no longer viewed merely as “vanity publishing” because marketing tools and full-fledged global distribution is more readily available to self-publishers. I think the DIY ethic of indie rock has also had an influence this. A few years ago I said to myself, why not just do it? Why not just publish a book? Plus, by that time I’d already edited and published a book by my friend Kari Tauring (The Runes: A Deeper Journey) so I knew exactly how to do it. I assembled most of what became this book in the spring of 2016 while my then infant daughter took a nap and my wife was away at a conference. It was a big help, of course, that I’d already written all the poems except for one or two that appear in the final section. What’s the most surprising thing you learned while putting it together? The most surprising thing I learned was how long it can take to get from square one to a fully-published product even when you’ve already got the text completed. Editing and proofing are difficult and can be a long process. Even with help from friends (and my mom! ), I was still finding tiny errors during the recording of the audiobook which I was able to fix in subsequent printings. Also, I was surprised (pleasantly) by how much some of my early poems still resonated with me after all this time. In what way is the book you ended up with different from the book you set out to make? I fully expected part 3, the most contemporary part of the book, to be much longer. But as it turned out, it was impossible because I found I did not have enough recent work of good enough quality at the time. At first, I was a little disheartened that so much of my good work was so far in the past. But in the year since I published, I have written so many good new poems I know I can flesh out part 3 of the book into its own volume at a future date. Retrospectively, the main benefit to me of publishing this book was to light a figurative fire under myself to write more and start to publish the new poems in journals. Every poem in this book is now off limits for submission because it’s already published. So, if I’m going to submit, I must write new poems. Maybe not an individual person, but I’m inspired by all the great indie musicians I knew when I lived in Minnesota. From them, I learned that DIY and World Class could be one and the same thing if you are driven to that sort of quality in your finished product. When you’re working for yourself, you need to be your own toughest critic and accept nothing less than the best. I learned this from others and I hope I embody those values myself now and can inspire others in the same way. There’s something here for people who have an appreciation of poetry and for people who don’t. You’ll encounter nothing particularly esoteric or snobbily poetic here. I recently completed a poem indebted to T.S. Eliot in the first stanza and Philip Larkin in the last. But it’s far from the point. And you don’t need to have heard of or read either of them to get the full meaning. Also, the book is often fun and funny. Oops, that’s 75 words!